Fact: Being over the age of 18 or 21 does not mean that you are mature. It means you are legally an adult. Unfortunately, in my community there are too many people that just “grew up,” but were never raised. They have the body of an adult, but the mind and emotions of a child. 1) They were raised in an impoverished environment and were not properly developed as a youth. 2) They experienced trauma in childhood and never moved past the level of development they were at the time. Of course, there are a host of other reasons that a person may not be mature. The opposite of being raised in poverty, is that some people are not mature because they were given too much and not required to do anything. There are spoiled rich immature adults too! I am focusing on these two reasons because that is my target population. Let’s examine these two reasons further. Raised in poverty. There is a concept called ‘Executive Function Skills” that I have been learning more about. Executive Function Skills are things that most people develop in childhood. Memory, long term thinking skills, impulse control, mental flexibility, organization, these are just a few of the skills. When a person is raised in poverty, these skills are not properly developed in the brain. There is actually “brain science” that shows the lack of development in a person who was raised in poverty. It explains the behavior that many people observe and may judge as irresponsible, and yes immaturity. Behaviors such as being late regularly, missing appointments, being aggressive and argumentative, chronic substance use, continuing to have children they cannot provide for, continuous bad relationship choices, and what can be viewed as an overall ignorance. Many middle class social norms were not taught. In my previous blog post They don’t know they don’t know I talk about how many people assume that what they know about life, everybody knows. They look at someone in poverty and assume they should know better, that they are choosing to live the way they do. That is one of the reasons there is so much judgement. I have clients who think the only “good job” is working in the automotive plant; that everyone gets food stamps and housing assistance, that only rich people can go to college, that the government is supposed to provide for their children. Many did not receive proper guidance from their parents. Some specific examples are: education was not stressed, physical, emotional, and mental abuse, and exposure to trauma. This leads us to the next reason that I have observed…childhood trauma. Childhood trauma. I have been learning more and more about the effects of childhood trauma. Most of the clients that I work with have experienced major trauma. There is a scale called the Adverse Childhood Experience Questionnaire. There are ten questions about being abused, intimidated, neglected, observing domestic violence, a parent who abused drugs or alcohol, or a parent who was incarcerated. When a person had these experiences in childhood, it effects their development and their life outcome. The significance of identifying these experiences is to work through them and the effects in your life so that you can fully become the person that God made you to be. Another reason is so you do not repeat these same experiences in the life of your children. Most of the women have experienced childhood trauma who come through the doors of the shelter that I work at. What is troubling is that some of them are not aware that the experiences are “traumatic.” It is the norm. Yes, you were molested, but most of the women in your family were. Yes, your father was incarcerated, and most of the men in your environment were as well. Yes, you did not have enough food as a child, but your cousins didn’t either. Unfortunately, their children are now experiencing many of the same traumas. So, the cycle continues. How is this related to maturity? Because if you did not properly deal with these experiences, you may still be immature. You may be that same 10 year old girl who was molested, that same 12 year old girl whose mother died, that 5 year old boy whose father went to prison, or that same 8 year old who went to bed hungry every night. So now that we have talked about immaturity, lets talk about maturity. 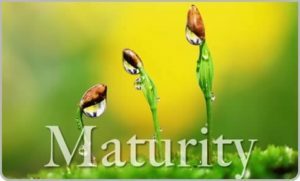 Some characteristics of maturity are: patience, long term thinking and planning, conflict resolution, timeliness, good communication skills, understanding, positive relationships, ability to hold employment, how you react to situations, ability to make good decisions, and stability. If you were raised in poverty, had traumatic experiences, and realize that you may not be mature, it is okay. The good news is that maturity can be developed at any time. As a matter fact, recognizing that you need growth in this area is a sign of maturity! 1) Seek therapy or counseling if you need it to help work through trauma you have experienced. 2) Seek out a Mentor or someone who displays maturity and ask them to work with you. 3) Become involved in groups, meetings, clubs, and activities that can strengthen your knowledge and thusly your maturity. 4) Pray and ask God for maturity, and even better, ask for wisdom! 5) Be intentional. Make a deliberate effort to become a more mature person. Let me also add that even mature people have immature moments; and if you look at maturity as a scale, there may be only a few people who reach full maturity. Most of us are a work in progress. I consider myself an overall mature person, however I am still growing in this area, and I definitely have immature moments! Hopefully our discussion makes you think about the level of maturity in your life. I also hope it helps you to have a little grace with people you may know or encounter who are not mature. Do not assume that they “know better.” You could try and help the person, give some advice, be an example of maturity to them, and most of all pray for them. Remember to always operate in love, because love covers over a multitude of sins.